Based on the idea of swinging on only one "axis," the Dr. Feelgood Zero Latitude putter makes good sense from a purely mechanical standpoint. As we all know though, even poor mechanics can end up with good results (e.g. Jim Furyk) and simply making a putter -- or any club -- with less variables is no certainty of success. 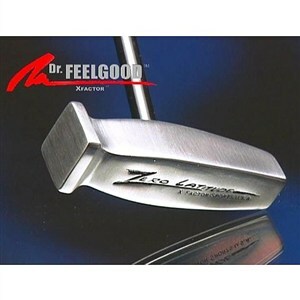 Created by Jack Hamm, an inventor certainly (I've seen him called "The Albert Einstein of Sporting Goods") and by most accounts, a showman of sorts, the Dr. Feelgood putter would fall into the "gimmick" category for most people. More closely resembling an inverted tack hammer -- similar to what you would use to repair the loose brads on Uncle Joe's favorite recliner -- than it does a putter, it does feature a proprietary central shaft which makes a true back-and-forth stroke an easy accomplishment, especially for those 3- and 4-footers that most of us dread. Hearken back to your 9th grade math class, and you may recall the X and Y axis (think graphs). The principle here is that putting is done on the X-axis, and this design removes the Y-axis from the equation. By taking one variable away, more putts can be made with less effort. Like many clubs of extreme design, this is a love-it-or-hate-it putter option. Many golfers will fall in love with the simplicity of the design, and no doubt it will feel just right to them. Others will find the design too narrow, too heavy, and something that just doesn't look like a putter. However, if you've played golf more than a few times, you know that having an alternate putter is nearly a must (and who among us doesn't have at least 2-3 backup putters?). Perhaps the Dr. Feelgood Zero Latitude putter will take a place in your stable of putters to be used when all else is failing.